Colorado isn’t known for an overwhelming number of dog-bite injuries, which may seem surprising considering how many Coloradans have dogs. There are steps to prevent dog bites in Colorado, no matter how often they occur. Usually it is owner error that leads to bites. Therefore, it is critical for Denver dog owners to understand local and state ordinances, as well as practical guidelines for owning a dog. Every year there are 4.5 million dog bites in the U.S. Many of these dog bites could have been avoided had the dog owner simply followed the law. Dog owners can help prevent dog bites in Colorado by following some basic rules. 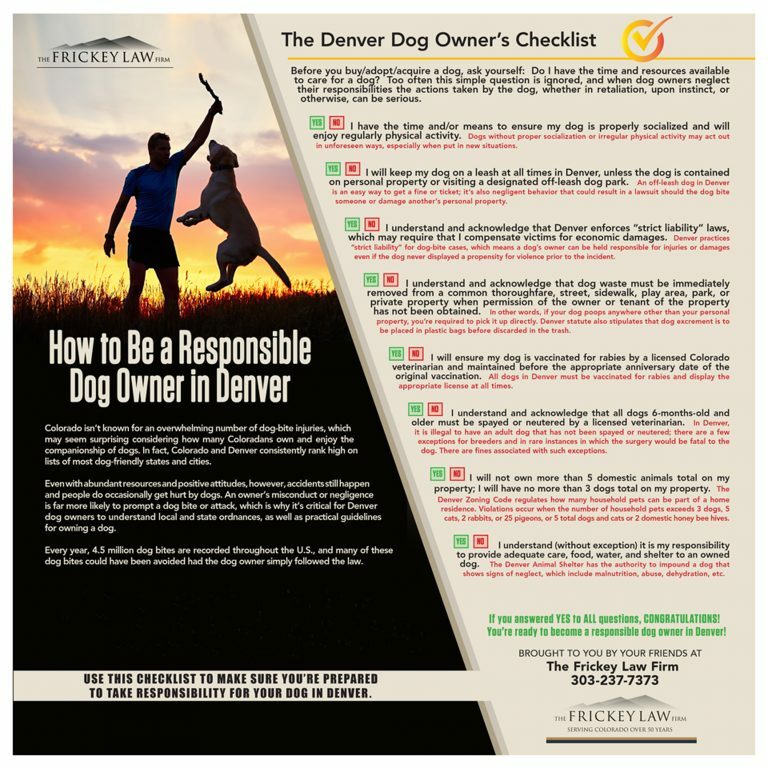 Click to enlarge or save your Guide to Responsible Dog Ownership in Denver. What can dog owners in Colorado do? To that end, download and/or print this guide to effective (and legal!) dog ownership in Denver to ensure you and your loved ones are ready to take responsibility for your new furry companion.You may even want to post one at your local dog park! Click here to view or download a PDF version of your Guide to Responsible Dog Ownership in Denver. Would you like more details about dog bites and Colorado-specific dog laws? Like the Frickey Law Firm on Facebook, or follow us on Twitter to stay up-to-date.